Download code examples, 1 (zip file)- main file: “workshop”. It includes all the examples reported in the first part of the workshop. 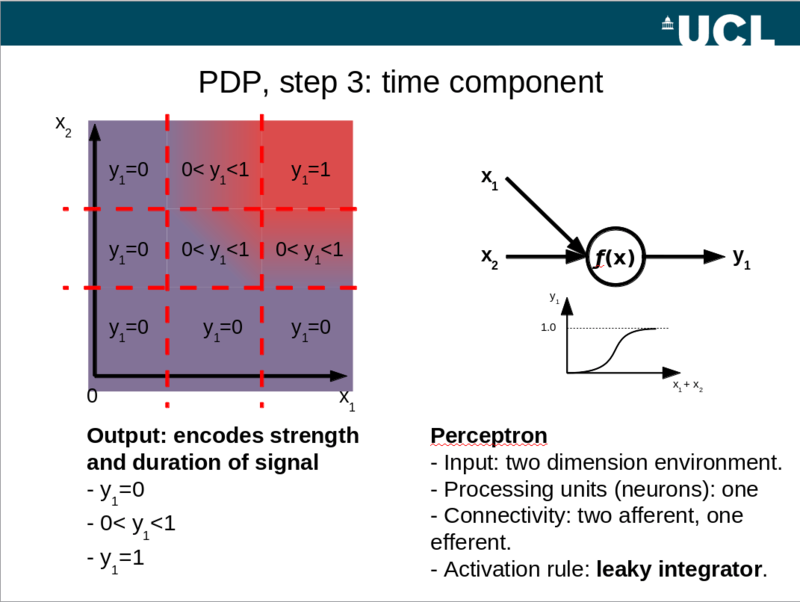 The neural units are computed as simplified leaky intergrators characterised by a tanh as transfer function. Download code examples, 2 (zip file)- main files: “workshop2”, “dopamine_learning” and “dopamine_modulation”. It includes all the examples reported in the second part of the workshop. Please consider the different Hebbian rules are commented in the main file “workshop2”: choose the input you want to provide the network (immediately before the for cycle) and then try the different learning rules to see the effects it has on the matrix of weights. Connectionism: from structures to functions. Abstract. Relying on a connectionist approach, we will show how networks of increasing complexity process data and develop categories. In the first part of the workshop, we will analyse different structures showing how each of them leads to unique sets of functions. In particular we will consider on-set and off-set detectors and we will compare winner-take-all systems (characterised by functional attractors) with oscillators (characterised by functional pattern generators), showing biological examples for each of these categories. In the second part of the workshop, we will deal with dynamic systems. A dynamic neural network changes its structure due to the presence of learning processes or neuromodulation. As a consequence, the unique set of functions associated to its structure also varies accordingly, allowing the system the plasticity to change the way it responds to the incoming inputs, altering the associated categories. The slides used during the workshop and the matlab programming code used to build the example neural systems will be provided at the end of the workshop. UCL workshop 01/2015. Sample slide.